First, I wanted to update the firmware to the latest version. The biggest challenge was that for the Mac, the installer was only available for Mac System 9. (I know, right?) So, being the techno-wizard I am, I dived head-first into looking at emulators to run the older Mac OS (like Sheepshaver and Basilisk II) but they couldn’t access printer drivers. Even using a DOS emulator like DosBox or a Virtual Machine like VirtualBox didn’t help. 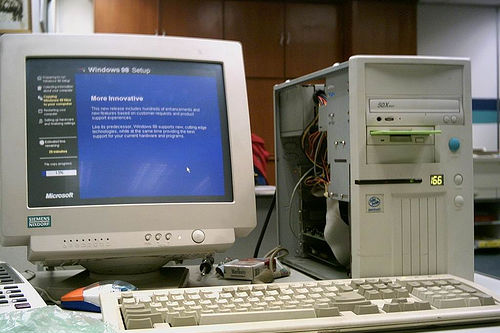 Eventually I tossed in the towel and went with the path of least resistance (or so I thought), dug up an old PC, some boot disks, and a copy of Windows XP (I know, right?) After several hours of being reminded why I made the switch to Mac, I finally was able to get XP running. I installed the printer driver, and then the Printer Service Utility v1.33 but the utility would not “see” the printer despite being able to print test pages. I uninstalled the utility, installed Status Monitor3 v3.1b to check the connection and that application worked fine. After rebooting and reinstalling, the utility finally recognized the printer and I was able to update to Firmware version BW1452_Q.UPG . The printer came to me in fairly good shape; no clogs or any of the major issues I saw commonly cited on Luminous Landscape and in the Epson Wide Format Yahoo group. So my concern with such an old printer was more on future-proofing; guarding against some of the planned obsolescense inherent in today’s hardware. There are only a few parts distributors listed on Epson’s Support Page for user replaceable parts. Most of these sites are god-awful, user-unfriendly garbage. CompassMicro – Surprisingly, this website was updated in 2013. I hope they didn’t pay a lot. Of the few parts listed for my model, most are marked as unavailable. Encompass Parts – Looks like it has a lot of parts but once you drill into the details and check the Total Availability or Estimated Ship Date you’ll see there actually aren’t. TSAWorld – Shows one part, but if you search by part number it has some listed under the 7600. Requires login to view pricing. PC Parts Canada – no pricing/availability just quotes. My foray into these virtual junkyards made me feel only more certain that I needed to stockpile some parts if and when I could find them. So the next stop, of course, was Ebay. 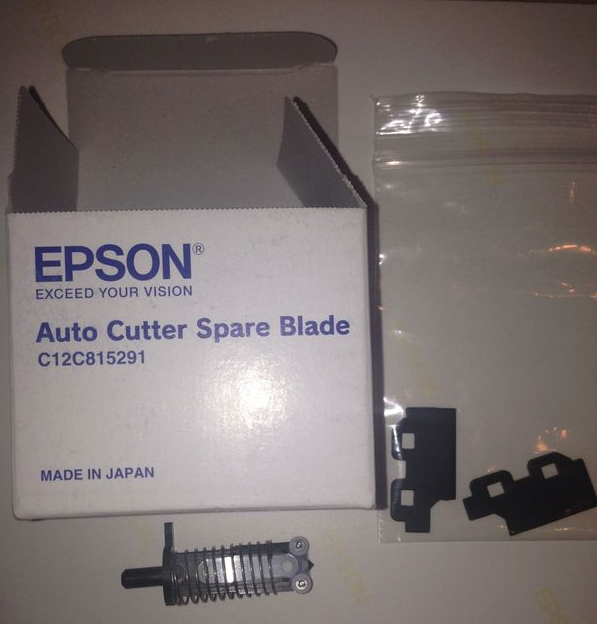 I picked up an Automatic cutter (part # C12C815291) for $60, less than the $95 Epson charges. I also bought three (at $6 each plus shipping) Head Cleaners aka Wipers (part #1230744 or #1113691 depending on where you look) from American Injet Systems because I didn’t trust the cheap knockoffs from China floating around on Ebay. Manual says they last about a year each and the status page I printed said mine was about 3/4th of the way through its useful life. A 220ml cartridge of Epson Ink for the 9600 retails at $138. So while people go crazy when gas goes above $4/gallon, a gallon of printer ink will set you back over $2,300. I wasn’t completely happy right off the bat. I found the cartridges wouldn’t stay in their slots like the OEM carts and constantly pop back out. 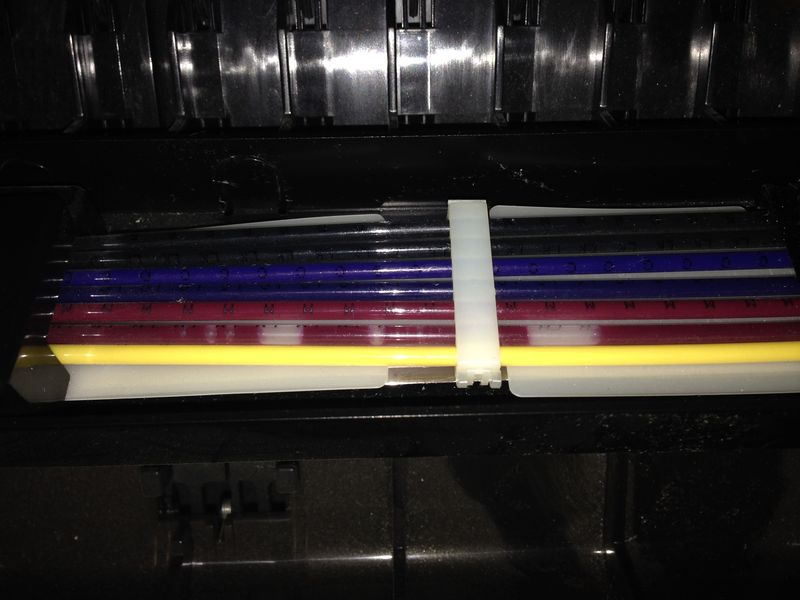 Because of this, I couldn’t get the printer to recognize that all new the cartridges were installed. It ended up being a game of whack-a-mole. When I got one working, the red light on another turned on. What finally worked was turning off the chip counter that keeps track of ink levels. I had planned to do that anyway to reduce the wear and tear on the delicate gaskets and chips caused by taking the cartridges in and out. 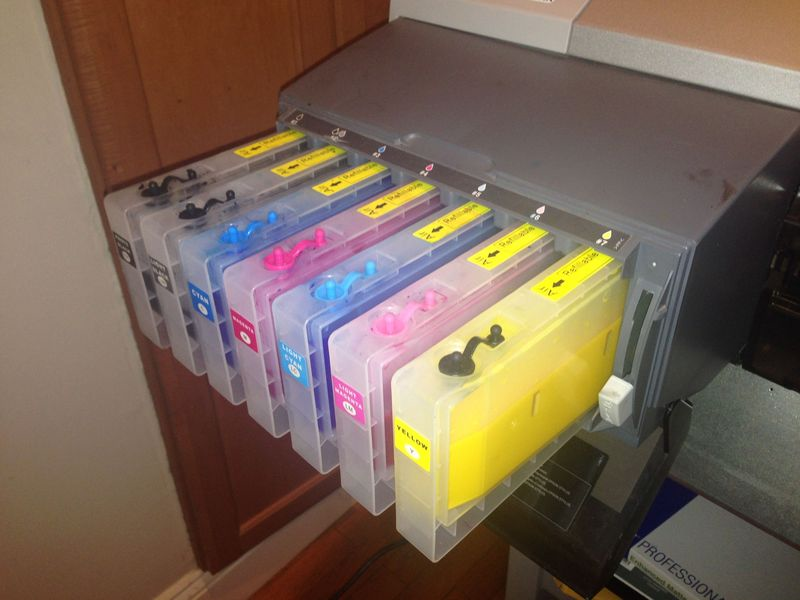 When I installed the cartridges, I hadn’t received my inks from ConeColor yet. I was too eager to play with my new toy and transferred the ink from my old OEM cartridges using a syringe. However, I was really low on Light Magenta and the amount in the cartridge wasn’t enough to keep air from getting into the line when I first ran the Int Fill procedure. My heart dropped when I saw bubbles in the line. I had to deal with the same issue for hours once with my 2200 and now I had the same problem on a printer 5 times as big and complex. Nearly all suggestions I read talked about taking out the dampers or running cleaner through the lines; actions that require lots of dismantling, replacing, and praying. My heart dropped with every word. Air bubbles than can potentially kill your print head. One forum suggested just running the Int Fill procedure again. This seemed the least invasive course of action. So when my ink arrived, I filled up the carts, primed each one again (just to make sure), and ran int fill. I watched it run, thinking there’s no way it’ll be this easy. Once it finished, however, a quick inspection showed the line was clear of bubbles. Nice! The printer gods must be smiling upon me. Next step was to print a nozzle check. “Error: Maintenance Tank Full”. Curse you, printer gods! When I took out the tank, I could feel that it weighed about 5 pounds (in other words, a few hundred dollars worth of ink). Mind you, I had just installed this new tank less than a month ago. 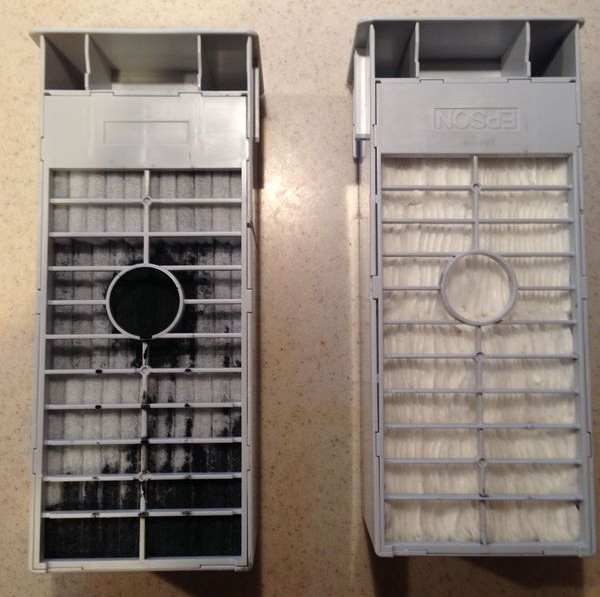 When you crack it open to get the used material out, you’re going to want to do this over the sink because a good amount of the ink will pour out. I rinsed out the whole thing being carefull not to get the chip on the side wet. (I was also able to rinse out the material — which comes in pre-cut slices — and save it for future reuse.) 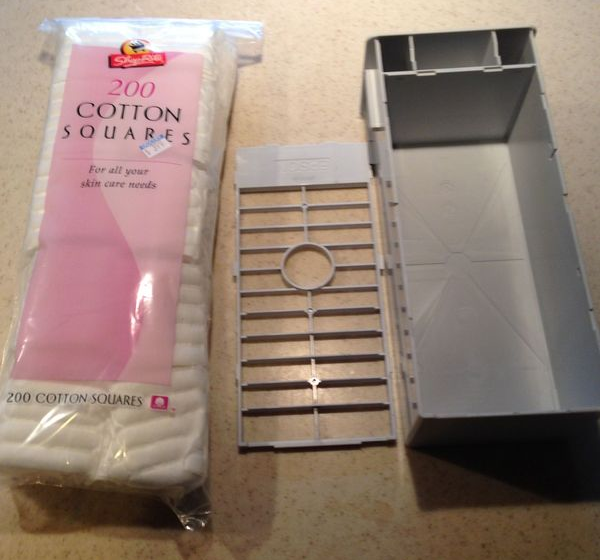 Then I stuffed the dried tank full with 2 packs of 2×2 Cotton Squares that I had bought for $5. Incidentally, I did look at using diapers but, damn!, they are expensive for something that just gets sh*t on. Paper towels are not a good choice since tend to disintegrate as they get wet. Cotton holds together better and, when placed on their side, I was able to pack the squares in much tighter than cotton balls. I used the chip resetter, popped the tank back in, and everything was good to go at 1/10th the cost. Packing an emptied maintenance tank with cotton squares. Since I’m not using official Epson inks anymore and I’ve heard about the 9600 exhibiting color drift over time, I’m planning to color calibrate the printer. My recent effort with my Spyder 2 helped calibrate my display so, I know what I see on the screen is what’s getting sent to the printer’s driver. However, without measuring the final output, I still haven’t closed the color management loop. For that I’ll need a Spectrophotometer. Back to Ebay, I guess. Omg you have saved me so much headache. Whack a mole is exactly right. Now I can actually work.